Warrenpoint Town defender Simon Kelly praised goalkeeper Aaron McCarey after his side’s 1-1 draw with Glenavon in the Danske Bank Premiership at the weekend. McCarey was on top form as he saved a Stephen Murray penalty in the first half before making two outstanding stops to deny Josh Daniels and Sammy Clingan in the second half. And Kelly - who marshalled the Town defence in the face of a second half bombardment from Glenavon - says they are lucky to have the keeper on board. “Aaron is different class - he is so good. We were very lucky to get him here and we have to enjoy him while we have him. He is top class and I can’t see him being here beyond January. He is a fantastic goalkeeper. The veteran defender - who spent time at Mourneview Park - believes the Lurgan Blues will be in there fighting to lift the league title come the end of the season. “I can’t see why not” adds Kelly, “They have some great young players like Caolan Marron, Mark Sykes and Rhys Marshall. They are unreal players and they are getting stronger. “The problem will be keeping some of them in January because they are that good - but if they can keep these guys - why not? “They are as good as anyone we have faced this year. They are a very impressive team. 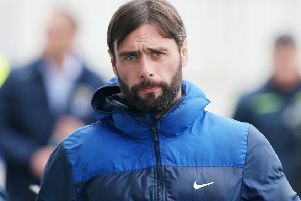 I have been impressed with Glenavon this year anytime I have seen them. They have bundles of energy and they are very good at what they are doing,” he added. And Kelly admits their main focus this season is to stay in the top division. “We are looking to stay up. We are not setting targets as to where we will finish, we just look to finish as high as we can and not get relegated,” added Kelly. 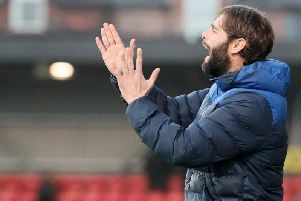 Frustrated Glenavon boss Gary Hamilton was not too hard on his players after the draw which had followed a defeat to Ballymena United the previous weekend. “It was really frustrating today. To be honest I thought we played really well but we are not taking our chances and working the goalkeeper enough. “We had all the ball and the energy we are playing with is really good. The most frustrating thing is that we can’t criticise the players’ performance and the same could be said for the performance against Ballymena. “I also thought regarding the two games, we didn’t get what we deserved out of them. We deserved a draw against Ballymena and I thought we deserved a win here today. Hamilton also had plenty of praise for his keeper Johnny Tuffey after the encounter. “He pulled off a great save in the second half and that’s the sign of a good keeper because for large parts of the game he had nothing to do. Next up for the Lurgan Blues is Crusaders and Hamilton knows that will be another big game for his side. “They are starting to put a run together and it’s another tough game. They are a difficult team to play against. The game when we played them here was difficult. “We got a good result that day and have always said that if you finish above Crusaders this year, you have getting European football at least and you have a chance of winning the league.